Join us for a unique tour opportunity of PlayBuild, a design education non-profit outdoor classroom located on a formerly vacant lot in the heart of Central City. PlayBuild, a 501c(3) non-profit, focuses on the transformation of under-utilized urban spaces into dynamic environments for kids aged 4 – 12 to learn about design, architecture, engineering, and related disciplines. A brief history of the organization and PlayBuild’s mission will be given by co-founder Angela Kyle, and project architect Rebecca Tamborella of Rozas Ward. 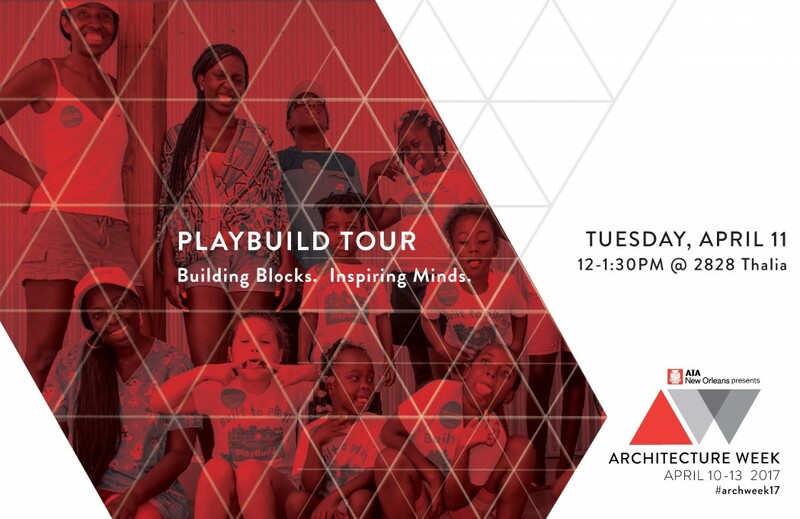 The tour will include a showcase of several kits of unique architect-designed large scale play “furniture” equipment – David Rockwell’s Imagination Playground, the Rig-a-Ma-Jig designed by Cass Holman, and the UNI cart designed by Howeler & Yoon. This event is part of a larger series of program for Architecture Week New Orleans, April 10 – 14, 2017. Registration is free for this event.